The summer may already have begun to feel like a distant memory, but Chevrolet wants to continue to give you reasons to celebrate. With unbeatable finance rates, 0% APR representative finance on selected models from the Chevrolet range and the opportunity to choose your own deposit, Chevrolet have some amazing offers designed to put the sunshine back into your life. Top of the wish list for those looking for a city car with 5-door practicality and 3-door looks is the Spark LS, with features in the range including central door locking and CD-Radio with AUX input, MP3 and USB connectivity. With prices starting from £7,925, you could take home a Spark 1.0 LS, from £99 per month for 60 months with a £1,985 deposit. 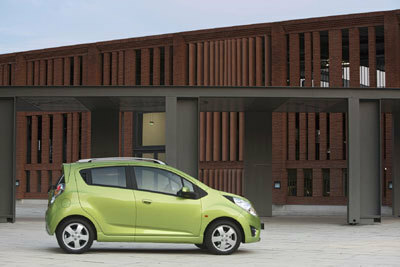 The Spark is not only attractive at Point of Sale however, it continues its low cost, great value offering with its environmentally friendly 119g/km CO2 emissions and low fuel consumption of up to 55.4mpg. Next in line is the sporty Cruze Hatchback 1.6 LS. With an offer price of £13,195, buyers could be forgiven for assuming it provides a basic package, when in fact for a deposit of £2,455 and 60 payments of £179, they could drive away with features such as ‘follow-me-home’ headlights, Electronic Stability Control (ESC), six airbags, air conditioning and remote central locking. For those looking for a bit more space, the Cruze Station Wagon 1.6 LS with its super-sized boot capacity (up to 1,500 litres), air conditioning, ‘follow-me-home’ headlights, Electronic Stability Control (ESC) and remote central locking is the one. The Cruze Station Wagon 1.6 LS is now available for £14,695, or £199 per month for 60 months with a deposit of £2,755. Next up, the all-new Chevrolet Trax 1.6 LT is perfect for keeping your adventures alive into Autumn, wherever you may want to go. The 1.6 LT model offers a variety of amenities such as; Bluetooth, Electronic Stability Control (ESC) and the new Chevrolet MyLink technology, designed to make your journeys that much more enjoyable. All this is now available for £17,495, or £229 per month for 60 months with a deposit of £3,755. If you’re looking for a car to keep your whole family together, the Chevrolet Orlando is the perfect choice. It offers versatility and safety in equal measures, with a 5* Euro NCAP rating as well as seven seats in three rows, with the option to fold flat the front seat for extra storage. The Orlando 1.8 LS also comes with air conditioning and Electronic Stability Control (ESC) all for a heartwarming £16,848 or £230 per month over 60 months with a deposit of £3,048. Finally, given Chevrolet’s 78 years of history with SUVs it wouldn’t be a complete offer without mentioning the Chevrolet Captiva. The Chevrolet Captiva 2.2 VCDi LT AWD is available now from just £20,495. This stylish vehicle lays claim to seven seats in three rows and 5* Euro NCAP rating, but in addition offers on-demand all-wheel-drive and cruise control – features designed to make driving in tricky conditions that much easier. To find out more about the Chevrolet range visit chevrolet.co.uk.